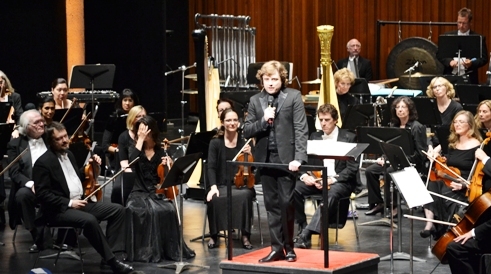 Guest conductor Jean-Philippe Tremblay succinctly described the musicians of our Hamilton Philharmonic as perfect. Easy to work with; dedicated; and sufficiently resolute that four rehearsals sufficed. Given the challenges and tonal descriptions of the concert’s subject matter – The Sea, he was not being facetious. The opening Mendelssohn ‘Calm Sea and prosperous voyages’ piece was technically faultless; even tempered and non-innovative. Then, Britton’s directorially challenging ‘Interludes from Peter Grimes’. Tremblay selected four of the half-dozen descriptives and transitionalized the themes; codas and solo slides with fluidity. The result was a smooth and continual configuration. Maestro Tremblay is comfortable & appreciative of the music; with his audience and certainly with the musicians. His erudition and commentary are a delightful experience. Post interval, the Sibelius Suite no. 2; “The Tempest” was composed as incidental music for the famous Shakespearean drama. With more leitmotifs than Rachmaninoff’s “Paganini variations”; the work is gargantuan. Tremblay & the HPO performed nine of the thirty-five selections. The interpretations were meticulous, with the podium seemingly over-focused on both violin sections as well as the celli/basses. The solos by clarinet and flute were performed with zest and embellishments; the harp backgrounds by Erica Goodman & Janice Lindskoog – charming augmentations. The evening’s final work was Debussy’s “La Mer”. This is an amazing composition in its ability to accurately paint an aural representation of something so visual as any large body of water. One can easily identify our own Great Lake’s moods in each of the three descriptives. The elusive and different wave sounds as well as the moods are all incorporated with varying emphasis and vigorous percussion. As a retired sailor, I kept identifying the themes with memorable occasions at the helm. This season ends but 2014/15 is when the HPO will choose its next artistic director. We intend to adjudge each candidate. Subscribers; don’t hesitate to approach us with your own opinions… they are as valued as ours.